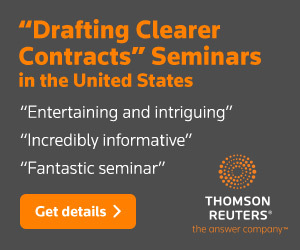 Has “A Manual of Style for Contract Drafting” Failed? [Updated 9 December 2017: I know that some of you wonder why I give airtime to people who disagree with me. Those people fall into two categories. First, there are those with some sort of credentials who publicly attack my work without justification; I think it’s in my interest to defend myself against them. An example is the person who posted the comment that prompted this post from a few days ago. And second, there are those with no apparent credentials. I’m inclined to ignore them, unless what they have to say is somehow of interest. An example of someone who met that test is the person whose comments prompted the post you’re now reading. What I found of interest in those comments is that the commenter asked why MSCD hasn’t had a more obvious effect on contract drafting. 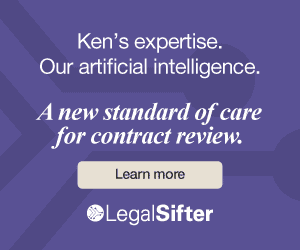 I’ve never thought much about that, simply because I’ve always known that because contract drafting is a precedent-driven part of a notoriously conservative profession, measurable change would take time. I’ve been satisfied to have my stuff be of use to those of us who want clearer contracts. But when this commenter raised the issue, I thought I might as well discuss it. But I didn’t particularly enjoy it. That commenter might have raised an interesting issue, but I found their comments weak, with an undercurrent of resentment. (No one else has come close to suggesting that MSCD has somehow failed.) They droned on, even after I told them to give it a rest. (I deleted some of their comments.) And they did it all while remaining anonymous: if you have something to say, say it without hiding. An ardent traditionalist, J. L. (I’ll refer to them as JL), went on a tear in the comments to yesterday’s post. What they had to say gives me an excuse to address an interesting question. I think you have to be open to the possibility that you might be the one who’s not making sense. At this stage, I think the market has spoken based on the lack of adoption in any material agreements after 15 years of effort. Ultimately, the lack of adoption I believe is due to the rejection of the ideas, rather than the market being unaware of your ideas. I could download 1000 material agreements from EDGAR, and none would heed any advice to Adams’ drafting principles. 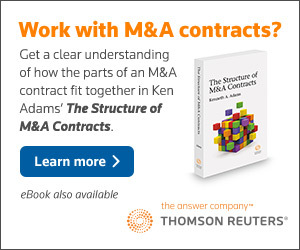 Where can I find one example of a contract that deals with real issues that follows Adams’ drafting principles? I think you have put in tremendous amount of effort in your 4 editions of the style guide. However, at some point, we have to look at the results and whether it has accomplished what it set out to do. If we cannot locate a single instance of an executed contract in this world that you think is a worthy example that embodies your work, then you have to ask yourself some hard questions. I wonder if the endeavor was destined to fail, or whether choices and decisions made along the way made it lose believers along the way. You can in fact find on EDGAR clear evidence that people are reading MSCD and following its recommendations. In this 2014 post I noted finding on EDGAR contracts that use one of the concluding clauses recommended in MSCD. So in that respect, JL is mistaken. Furthermore, you have only to look at comments by others to yesterday’s post to see that people are drafting contracts consistent with MSCD’s recommendations. No surprise there: change in contract drafting doesn’t require winning the popular vote. If you have the time and inclination to draft consistent with MSCD’s guidelines, the only buy-in you need is from those on your side of the deal and those on the other side of the deal. That’s not much of an obstacle, particularly given that contract prose that complies with MSCD guidelines doesn’t attract attention to itself, except for two usages (using this agreement, with a lowercase a, and using states instead of represents and warrants). Also relevant is a general enthusiasm for MSCD. It has sold tens of thousands of copies, and the ABA has told me that sales of the fourth edition are “huge.” Furthermore, I do seminars and consulting work for a roster of global companies, and with each passing year I find myself doing public seminars in ever more countries. All that doesn’t much smell like failure. That said, signs of MSCD creeping into the mainstream are corks bobbing on an ocean of dysfunctional traditional contract prose. In particular, the usages on display in the big-deal documents that JL invokes are antithetical to what MSCD recommends. But it’s preposterous to suggest that that means that MSCD has somehow failed. For one thing, the defining characteristic of the current system is that it’s resistant to change. Contracts are drafted by copy-and-pasting, on faith, from templates and precedent contracts of questionable quality and relevance. Given inertia, the pace of transactional practice, and structural impediments to change, it’s enormously challenging for law firms and company law departments to stop the whirring machinery, dismantle it, retool it, and put it back together. Change is so hard to come by that sweeping change will require overhauling the entire contract-drafting apparatus. MSCD is just the first step—the foundation. Next, we need a subscription library of automated templates; a certification program; and an online contract-drafting course for law schools. We’ll see how much of that comes to pass. But even if you assume that none of it does, and that drafting consistent with MSCD’s guidelines is limited to an enlightened minority, that still wouldn’t mean that MSCD had failed. Instead, that failure could be laid at the door of the legal profession. But I’m not sure if anyone’s ever been real with you and given you honest feedback, that you may be on an island. To which I say, You cannot be serious! (Cue John McEnroe.) I have engaged endlessly. With my readers. With seminar participants. With consulting clients. You can find plentiful evidence of that in the way I’ve constantly addressed new topics in my writings and in adjustments I’ve made. Well, it so happens that I am right. Or rather, that by virtue of years of work, my constantly airing my findings in the marketplace of ideas, and my having been able to call on prominent experts for advice, MSCD’s recommendations make sense. My debunking what passes for conventional wisdom isn’t a sign of my grandiosity. Instead, it reflects structural defects in the copy-and-paste system and the dearth of scholarship on the building blocks of contract language before I came along. That I have the field essentially to myself presumably reflects that no one else has had the necessary combination of skills and appetite. As regards my calling other people idiots, I suggest that JL is mistaken: in fact, I simply say that they’re wrong. Of course, if you’re badly wrong, that can make you look like an idiot, but that’s not my problem. Sometimes the conventional wisdom is ludicrous enough that I can’t resist gently mocking it. That’s part of keeping myself and (with luck) my readers entertained. Of course, if someone takes a potshot at me, I defend myself.